Seville is considered one of the oldest bullfighting enclosures for bullfighting of Spain. It is the main venue for the bullfights that are held in the city having special importance the “aficionados” which are celebrated during the Feria de Abril. The ring is one of the most important tourist attractions of the city and one of the most important tourist attractions of the city and one of the most visited. 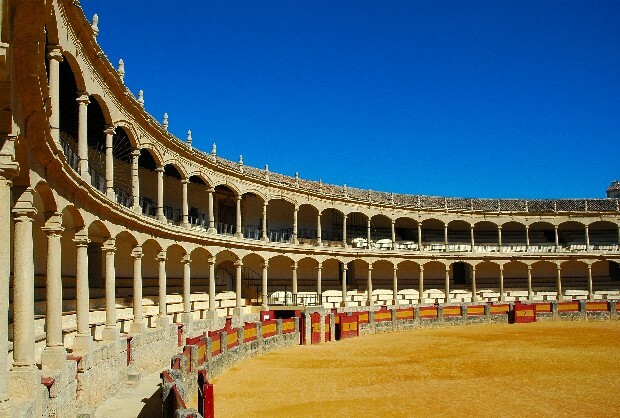 The “coso” maestrante, (enclosure) has a capacity for 12500 people. The bullring is the property of the nobiliary Corporation with its headquarters in Seville from where it takes its name. Integrated by horsemen pertaining to old noble families it carries out activities of beneficial and social character, the promotion and support of equestrian art and bullfighting. The excercise of cultural and artistic patronage is another of its dedications. In the creation in 1966 of prestigious awards to the best dossiers of the schools and faculties of the University of Seville, like awards to young researchers, sponsorship of activities of social institutions in the city, as well as music concerts and a variety of other artistic events. Around the borders of the bullring there are statues dedicated to the sevillian bullfighters who have triumphed most, as for example, the one of Curro Romero. In 1749 begins the construction of a circular ring on mount Baratillo to substitute the rectangular bullring already built on the same site. Later, in 1761, the construction by ochavas is undertaken, (one ochava is the equivalent to four arches). Francisco Sánchez de Aragón and Pedro and Vicente de San Martin are the construction formen of this stage. The inner facade of the ring, called Palco del Príncipe, (Theatre box of the Prince) is completed in 1765. this balcony consists of two parts: the access door of the bullring, from where the bullfighters leave, and the balcony proper of exclusive use of the Royal Family. As Carlos III in 1786 prohibited bullfights the works were discontinued, even though only a third part of the bullring had been constructed. The covering roof of half the bullring is finally completed 34 years later, to the left and right of the balcony of the Prince leaving open a panoramic view of the Cathedral and the Giralda. In 1868 the Diputation Balcony was in a lamentable state and called for improvements, such as new flooring and a marble balaustrade, plus the shield of the Royal Maestranza de Caballería, a work by the italian sculptor Augusto Franchy. Five additional balconies are built on each side of the Palco de la Diputación, where we now find the clock of the bullring. In 1881 the bullring was completed, two thirds in stone and the remainder of wood. Between 1914 and 1915 the stone tiers were substituted by brick under the direction of the architect Anibal González of Seville. Then all the tiers were reconstructed with a gentler slope. The number of tiers in the shade area were enlarged from ten to twelve and to fourteen in area in the sun, with three more tiers at ring-side. The Bullfighting Museum of the Royal maestranza de caballería is located beneath the tiers of the bull-ring and was created in 1989. visitors can find the history of the National Fiesta through a collection of paintings, photos, bullfighting posters, bullfighting suits, bronze statues, tiles, etc. you can see the work of mariano Benlliure and busts of legendary bullfighters like Curro Cúchares, Pepe Hillo or Espartero.